Hopefully you will have found our 2015 advice and taken a look through and also considered your annual cures for 2015 to ensure a smooth year ahead, if not please follow this link for more details. From 6th January to 3rd February 2015 is the twelfth month of the Jia Wu year (Yang Wood Horse year) with the ruling energy of #6 in the central grid. South & west – People working in offices or people who work from home with doors opening or if they have their office in the south or west may find their business goes up a few beats this month which I am sure will be welcomed after the Christmas and New Year expenses. The energies denote great business opportunities so make hay whilst the sun shines and it will be nice to start the New Year with a good month. There is no need to enhance the sectors. If you happen to occupy an office in either of these two sectors in your office or at home, stride ahead with your plans and ventures. Keep a task light on your desk for better concentration. These two locations are also good for studies. Students preparing for exams should take advantage of the influences of these areas in January and should make sure that they face one of their good directions when seated at the desk. A task light on the desk will help to keep them focused with the tasks at hand. If you have a crystal globe this is a great place to place it this month. These two areas this month will benefit from quartz or glass crystals. Try and store important papers here (south) this month but make sure you check back next month on where you should move them to. For those who like to work with symbolic objects, you can place your three legged toad in the south or west corner of the office /study but make sure that it faces into the room and not outwards and the coin is always kept in his mouth. East – A mix of good and bad here. Writers, artists or anyone who is looking for enhanced creativity should make good use of the benevolent influence of the month if your room is in this part of the house or office. Whilst there’s good signs for those in the writing field, tensions may crop up between couples and their in-laws, especially those who live in the same household, causing stress to the family. Avoid unnecessary harsh words and have extra patience and tolerance for the month. This combination can cause unwanted thoughts. Doom and gloom, causing stress and is not good for health, especially if this is a bedroom occupied by ladies. Place six Chinese coins in a row tied with red ribbon. Try and leave windows or doors open as much as possible. You can also place some indoor bamboo. Use a salt water cure here if it is an important room like a bedroom or lounge, kitchen etc along with six Chinese coins tied in a row with red ribbon. Good colours to use here are blues or blacks and the deeper the colours the better. The east can be a good sector for those who are looking to tie the knot or for whom romance is on the agenda. The energy of the month can be conducive for building long term relationships. You can place your mandarin ducks or rose quartz double hearts here to strengthen the romantic influence present in the east in January. Northeast – Tension, disputes and ill temperaments are indicated causing potential stress and disappointment. Relationships may deteriorate into tiresome battles in January so please try to avoid moments of stress and anger. Being patient and avoiding confrontation is the best cure for the northeast this month. Using blue furnishing for the month or display blue ornaments around the room may help calm this fiery interaction. If your kitchen is in this part of the house, be aware of fire hazards and make sure that no fires lit are left unattended. So if you haven’t got a smoke alarm now is a good time to fit one and also check batteries if you have one fitted already. Anyone and particularly elderly people with a weak heart should try and avoid this palace. If this is not possible, use blue in the room’s furnishing e.g. beddings, doormats or rugs. Place some blue items on your work desks if your office is in this area. Do not get drawn into any heated disagreement. What needs to be said can be said when tempers have cooled. Red colours or any ornamental objects that are sharp or triangular in shape are best avoided in this palace. You can also place some earth objects, e.g. a round clear globe or quartz crystal, a boulder, or some terracotta pots in the south of the room to calm the fiery combination of this month. North – Anyone who is recovering from illnesses this month should avoid using this sector during January. If this is not possible, place some metal objects (metal wind chime or Wu Lou) in the north corner of the room to negate the negative energy for the month. If your front door is located here and if you are looking for a job, do not get disheartened by the lack of positive responses during the month, this could be due to the influence of the energy in this location. Ladies who are pregnant and are occupying this room should take extra care this month. Rest is essential, it is better to move out of this room for the month. If you are unable to, make sure to place metal cures in the north corner of the room such as a Wu Lou or anything made of good strong metal. Businesses with a main door in this palace should not take unnecessary risks this month. There is not much headway this month so, don’t waste time. Use your energy in a more effective way by planning for the month ahead instead. Next month, you will see great improvements in business and contacts. Whether this is an important room or not, you should avoid disturbing this sector of the property. Do not conduct any noisy maintenance work or construction to this corner of the property. Refrain from drilling or hammering the north wall of the room. Above all, do not dig the ground of this corner of the garden. Southeast – This is where the monthly 5 Yellow will reside for the month of January bringing possible obstacles and mishaps in endeavours. So please do not disturb this sector with noisy renovations or banging of doors especially if this is your front door. In the office, keep out of office politics as the interaction of energies in this sector brings business disputes causing stress and ill health. Take extra care on the road too during the month if your work requires you to travel quite a bit. My advice is to be very careful with the southeast in the month of January. Do not undertake any form of renovation, hammering nails or drilling in the wall, or disturb the earth with digging work for ponds, wells or swimming pools. Working with any noisy equipment in this area is also not advisable. Avoidance is the best cure for this combination of qi. If you cannot avoid using this room, make sure that metal cures are in place like a Wu Lou and/or six Chinese coins tied in a row with red ribbon. Use metal such as gold, copper or brass. You can use whatever still metal objects you have got handy in your house but do avoid objects that are sharp or menacing looking. Do not place any red, pink or orange colours in this area or anything triangular or square in shape. Instead of using metal objects, you may also use the salt water cure. 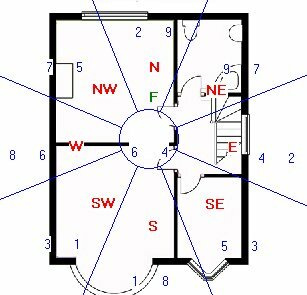 If there are external poison arrows, for example, sharp roof lines, sharp images or unfriendly structures pointing at your property from this southeast direction, this may bring fire accidents. Place a Ba Gua outside if your main door is located here. If this is your bedroom, you would be well advised to refrain from using red in the general décor for the month. Place some blue items instead to calm the fiery interaction. Northwest – Beware of health issues if you occupy a northwest room in the office or home. Mouth ulcers may flare up or you may find a weakening of internal energy that slows your work down. Remember to drink lots of water. Southwest – Tempers will flare this month. Beware of those possible moments and try to handle situations with a calm and cool attitude. Avoid office politics whenever possible. Add something red like a rug, cushion, floor covering or even a red Dragon to dissipate the negative energy here. East – A repeat from above as there is a mix of good and bad here. Writers, artists or anyone who is looking for enhanced creativity should make good use of the benevolent influence of the month if your room is in this part of the house or office. Whilst there’s good signs for those in the writing field, tensions may crop up between couples and their in-laws, especially those who live in the same household, causing stress to the family. Avoid unnecessary harsh words and have extra patience and tolerance for the month. I hope you all enjoyed reading and have a great start to 2015. It’s really useful. I think it’s possible to find out the lucky day for any activities related to any individual/family/business in a month. My land direction is East in JIA Mountain. Hi thank you for the information. Always enjoy reading it every month but is there no update for the west?